On Monday, United States Vice President Mike Pence warned North Korea it could receive the same treatment as Afghanistan and Syria, both of which the White House bombed recently, if it were to continue with its nuclear testing program. The stern warning, delivered by the vice president in Seoul following his visit to the demilitarized zone that separates North and South Korea, could spark speculation that the Trump administration is contemplating military action against the Pyongyang regime. Pence said the White House administration wants to convince the North Koreans to abandon their nuclear weapons via peaceful means. However, he repeated the warning by the administration that all options remained on the table. 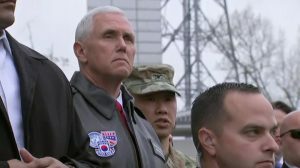 Pence arrived in Seoul only hours after the most recent ballistic missile launch by North Korea. The missile exploded within seconds of blast off. The weekend also included much fanfare across North Korea as the regime paraded what looks to be new missiles designed to reach the U.S.
During his trip to the zone between to two Koreas, and later during remarks to the media, Pence issued his strong warnings to North Korea. He said in only the last two weeks, the world has witnessed the resolve and strength of our new U.S. president in actions taken in Afghanistan and Syria. He added that North Korea should not test the president’s resolve or the strength of the U.S. armed forces in the area. Earlier in April, on the command of Trump, the military launched cruise missiles (59) at a military airfield in Syria as retaliation for the chemical attack that killed dozens of civilians. Less than one week later, the military dropped a bomb that weighed 22,000 pounds, which is the largest bomb that is non-nuclear ever used by the U.S. in combat, on forces from the Islamic State in Afghanistan. Any potential military strikes against North Korea would likely bring diplomatic crisis for the U.S. with China, which is a main economic lifeline of North Korea. Both U.S. Secretary of State Rex Tillerson along with Pence stated that the strategic patience from the Obama policy of pressuring North Korea is over and military action is now a viable option to make North Korea shut down its nuclear program. The decision by the U.S. Navy to reroute a strike group on an aircraft carrier to the region as tensions increased has also fueled more speculation the White House might make a pre-emptive strike on military facilities in North Korea.